In last week's eHay Weekly "Road Trip" report from Georgia, University of Georgia Extension forage specialist Dennis Hancock indicated that bermudagrass stem maggot was being found in the southern half of the state. Late last week we also heard from Texas where Vanessa Corriher, forage specialist with Texas A&M AgriLife Extension, reported that the pest had been documented in seven of the state's counties. At the very least, this puts farmers and consultants on high alert for the pest in 2015. The bermudagrass stem maggot is native to South Asia (from Japan westward to Pakistan) and was first reported in the United States in Georgia in 2010. The fly (yellow with black head) lays its eggs within the stem of the bermudagrass plant. The resulting maggot moves to the last plant node and consumes the plant material within the stem. This stem damage results in the death of the top two to three leaves while the rest of the plant remains green. From an appearance standpoint, the bermudagrass appears frost damaged. The amount of damage seems to be dependent on growing conditions as well as the point during regrowth when the flies lay their eggs. If there are favorable growing conditions with good soil fertility and moisture, the loss seems to have minimal impact on dry matter yield. However, if forage production is limited by poor soil fertility and dry soil conditions, more damage can result. Forage specialists also suggest that some varieties are less susceptible to stem maggot damage than others. The plant shoot stops elongating as a result of the insect's damage. In response, the plant may grow another shoot from a lower node of the damaged shoot. This new shoot can also be attacked by later generations of the bermudagrass stem maggot. Most producers will typically see the resulting damage before finding the pest. Once a field is infested with the pest, further plant growth and additional yield accumulation is minimal. The damage is less pronounced in a grazing situation as livestock tend to eat the pest along with the grass. If damage is noted within one week of harvest, cut and harvest the crop as soon as weather conditions allow. If damage is noted within one to three weeks of the previous harvest, cut and bale (if feasible) the forage to remove it from the field. This will increase the chance of a successful regrowth. Chemical control can be accomplished by spraying severely damaged fields with a pyrethroid insecticide a few days after baling the previous crop, then spray again five to seven days later. Pyrethroids are relatively cheap and have a short harvest interval. 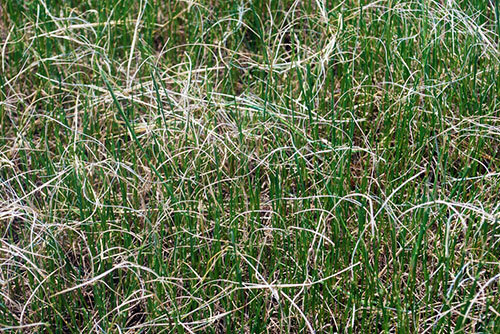 If you want more information on bermudagrass stem maggot, see this factsheet Biology and Management of Bermudagrass Stem Maggot from the Alabama and Georgia Cooperative Extension systems.